The Navajo Nation occupies a large portion of northeastern Arizona, as well as part of northwestern New Mexico and southern Utah. Its capital is at Window Rock, Arizona. Covering 27,000 square miles (70,000 square kilometers), the Navajo Nation is the single largest Native American reservation in the United States. Note that the Navajo Nation observes daylight saving time throughout its territory—even in Arizona, which otherwise does not use DST. This means that the Navajo Nation will be an hour ahead of the rest of Arizona during the DST period. Drive. Navajo Nation is far from major airports, and commuter air service into Farmington and Gallup on the New Mexico side is marginal and leaves you a long way from most of the reservation. Rail service is similarly marginal and distant, although the Amtrak line between Albuquerque and Flagstaff passes through Gallup and along the southern side of the reservation. Window Rock, administrative center of Navajo Nation, is relatively close to Interstate 40 near the New Mexico-Arizona state line. It and the other major settlements on the reservation (Ganado, Chinle, Kayenta) are reachable by good roads. Because this area consists of vast stretches of open land a car is necessary to get around. Be sure to fill up your gas tank when you have the opportunity. Service stations are few and far between in this region. Monument Valley - buttes, spires and mesas form a landscape which has been the backdrop of many films about the Old West. 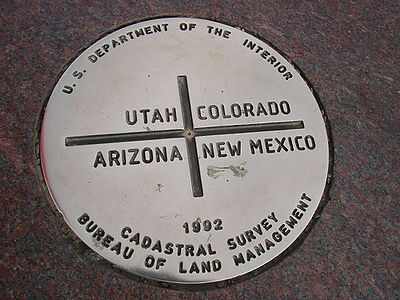 Four Corners - Utah, Colorado, Arizona and New Mexico meet at one point. Nothing special visually, but where else can you have a limb in four states at one time? Shiprock, southeast of Four Corners near Farmington, is another fantastic bit of desert scenery. The characteristic folk art of the Navajo is the Navajo rug (or blanket). Each region of the reservation has its own characteristic style of weavings, with a few patterns that can be found reservation-wide. As with other folk art, quality and prices vary wildly; small items for the tourist trade can be had for as little as $20 or so, while a gigantic, museum-quality (but brand-new rather than antique) rug from the prestigious "Two Grey Hills" region sold for $60,000 at a Santa Fe Indian Market a few years ago. The key thing to remember is that the value of a particular weaving is the value you place on it. If you see a piece you like, haggle over price if you wish; if you don't get the price you want, look for another one. There are several other trading posts on the reservation that still are "working" posts, in the sense that they function not just as distribution points for goods bound into the reservation, but also places where weavers and other artisans can trade their rugs for goods or put them up for sale on a commission basis. Selections tend to be small, but the quality is usually very good (the trading-post operators don't bother with junk) and prices are better than in the galleries of off-reservation art centers like Santa Fe. Many of the reputable posts are off the beaten path -- sometimes far off it. Three worth visiting are at Two Grey Hills and Crystal in New Mexico, and the extremely remote Shonto in Arizona. For the less adventurous, most of the towns on the reservation have galleries with good reputations for authenticity, although you'll pay more for a given rug there than at the posts. Selections tend to be broader than at the posts. Reputable galleries are in Ganado, Kayenta, Monument Valley and Teec Nos Pos in Arizona, and Bluff in Utah, among others. Possibly the most entertaining way of getting a rug, and one that can offer excellent value for dollar along with a fascinating cultural experience, is at a rug auction. If you're in the area on the second or third Friday of every month, Crownpoint, a tiny town between Farmington and Grants, hosts the Crownpoint Rug Auction. The Crownpoint Rug Auction gives buyers the unique opportunity to purchase Navajo rugs directly from the weavers themselves, at prices well below retail. Before the actual auction, you can hold rugs in your hands and appreciate them up close. Some sell for $50 or less, and some sell for thousands of dollars. Value for dollar is particularly good during the spring. Weavers come from all over Navajo Nation to sell rugs at Crownpoint. Even if you don't buy anything, you are in for a treat. No two rugs are alike! Most reservation centers that sell weavings also sell pottery and jewelry made in Navajo Nation. Navajo silver work, including concho belts, tends to be of a very high quality. The pottery is quite different from that of the Pueblo Indians to the east, but good Navajo pottery is still an art form and well worth collecting. Two warnings are necessary, however. First, you don't have to get very far out of Navajo Nation to encounter bogus "trading posts" in which the goods are not Navajo at all, but rather cheap imports. This is particularly a problem with jewelry. Second, removal of "prehistoric" pottery from Navajo Nation is strongly discouraged and likely illegal; it is certainly illegal to obtain such work from excavations of archaeological sites, whether acknowledged or not. Settle for the modern stuff; it still qualifies as entirely authentic Navajo arts and crafts. One of the characteristic food items of the Navajo Nation is "frybread." This is a flat bread about the diameter of a common tortilla, but quite different from a tortilla in that the process of preparing it (via frying rather than baking) causes it to become crisp and develop bubbles and pockets, so that it more closely resembles the sopaipilla of northern New Mexico. Frybread is eaten alone, with powdered sugar or honey as a dessert, or piled high with lettuce, tomato, cheese, ground beef or chili beans; the latter form is commonly called a "Navajo taco," although it has little to do with a conventional taco beyond the fact that it shares many of the same ingredients. Navajo tacos and other frybread dishes can be found at restaurants, and roadside stands, throughout the reservation, many of which also feature distinctive mutton dishes. Alcohol in any form is prohibited within Navajo Nation. If you simply must have a beer, Flagstaff (Arizona), Farmington (New Mexico), and Gallup (New Mexico) are just outside the borders of the reservation. Don't expect to be welcomed with open arms at bars in the latter two, as bars there have serious problems connected with alcoholism on the reservation. The presence of Northern Arizona University at Flagstaff makes night life in town somewhat more convivial. Kayenta has several motels and motor lodges, of which the Best Western Wetherill Inn is notable for the attached gift shop/gallery with a surprisingly good and reasonably-priced selection of Navajo rugs. On US 163, phone (928) 697-3231; rooms from $55. Goulding's Trading Post and Lodge, in Monument Valley, Utah, is in a beautiful location, also offers Navajo rugs on-site, and has a good reputation. Try it and write a review here. The Hopi Indian Reservation is embedded in the western part of Navajo Nation. The Hopi are ethnically distinct from the Navajo; continuing land disputes between the two tribes led to the creation of a curious "reservation within a reservation" now occupied by the Hopi. Hopi pottery is particularly fine, and the collector of folk art may want to make a side trip to Polacca or one of the other Hopi settlements. Photography, sketching, etc., may be restricted; inquire locally. Note also that the Hopi Reservation follows Arizona's non-observance of DST, meaning that during the DST period, Hopi territory will be an hour behind Navajo territory. Several United States National Park System units are in or near the Navajo Nation, including Hubbell Trading Post National Historic Site, Canyon de Chelly National Monument and Navajo National Monument in Arizona, Hovenweep National Monument on both sides of the Colorado/Utah state line, Mesa Verde National Park in Colorado, and Chaco Culture National Historical Park and Aztec Ruins National Monument in New Mexico. The Grand Canyon is also fairly close. This travel guide page was last edited at 10:06, on 14 January 2019 by Wikivoyage user Traveler100bot. Based on work by Wikivoyage users Balkywrest, Mx. Granger, Zcarstvnz, AndreeBot, Inferno986return, Traveler100, SelfieCity and Dale Arnett, Wikivoyage anonymous user 24.20.71.122 and others.